Do you feel like you have battles going on inside? Learn how to help your parts to cooperate with each other. Do you have difficulty make decisions. Learn how to resolve opposing viewpoints and become decisive. Do you indulge yourself and then judge yourself for it. Understand why this happens and what to do about it. Do you avoid taking action that you know you is necessary. Learn how to resolve this inner confusion. Do you often have contradictory feelings about loaded situations? Learn how to integrate these different parts of yourself. 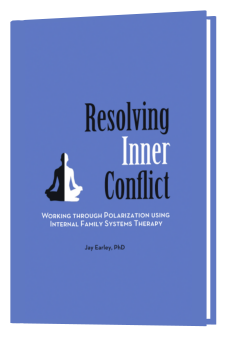 To listen to a 45 minute recording of a teleseminar on polarization led by Jay Earley, click here.